We’ve just had an urgent request for warm clothes and blankets to go to Kurdistan, where there are 1.8 million refugees. Most have fled civil wars and ISIS in Syria and Iraq. Last winter 6,000 refugees died from the cold. We have now found a way of getting a convoy through, which would deliver the stuff safely. However it will cost about £4,250 to get around 91,000 items there, in a 90 cu metres trailer. With a very conservative estimated value of £522,000, for the items being sent, this works out at less than 5p an item. 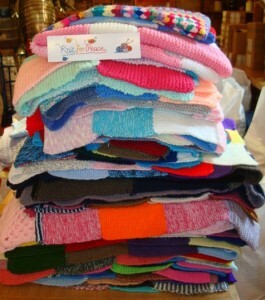 And a wide variety of scarves, cardigans and jumpers suitable for all knitting abilities.